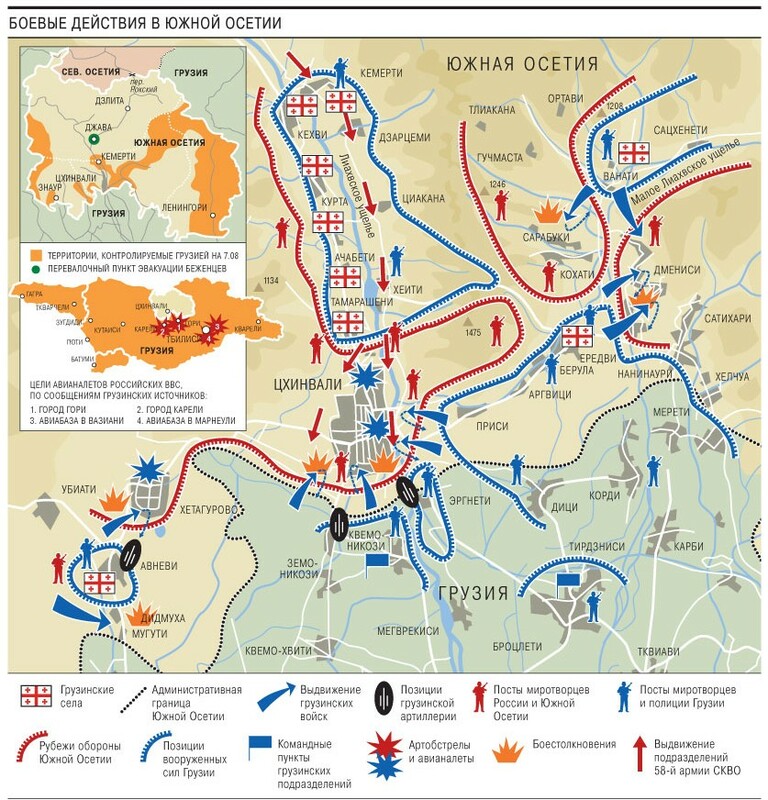 As usual and as a complement to my previous post September U.S. 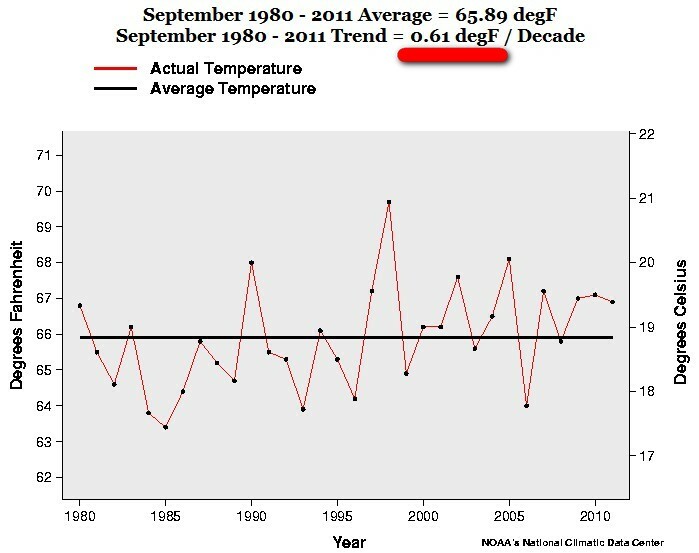 Temperature – The trend is 0.07 deg F / Decade, I thought it would be interesting to look at the recent September US temperature from a “historic” perspective. To see how the decade trends have evolved during the last 111 years. 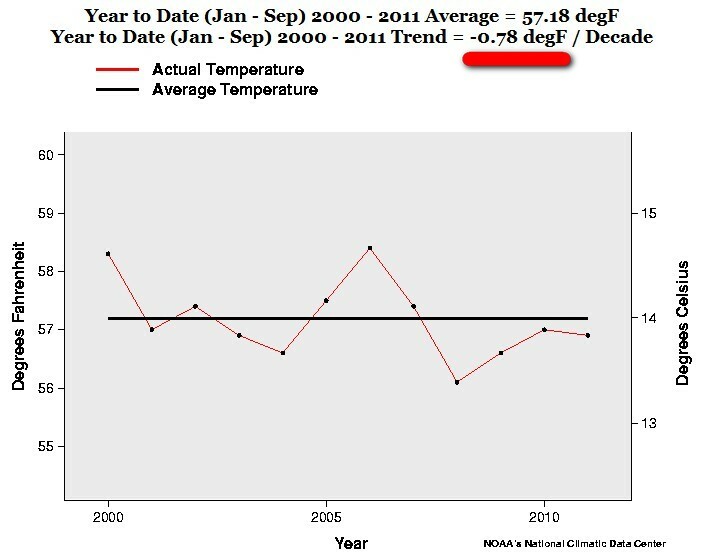 So the “warming trend” 2000-2011 for September is exactly 0.35 F degrees a decade. That is a whopping 3.5 F warmer in 100 years. Take cover! 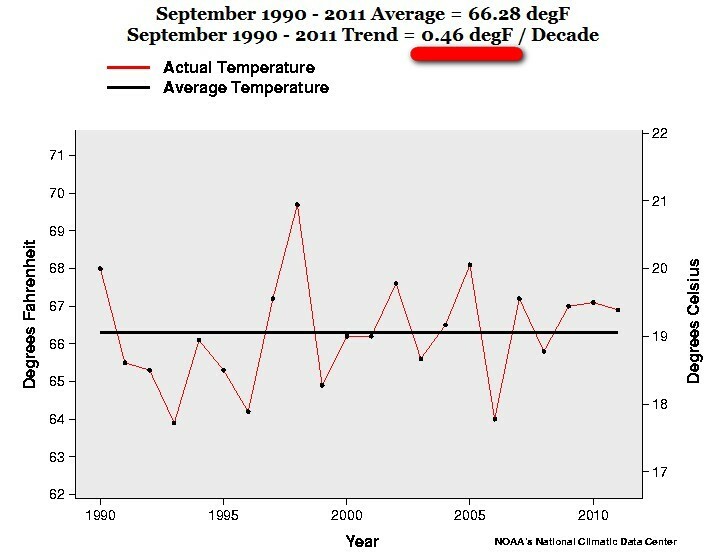 The September trend 1980-2011 is exactly 0.61 F degrees a decade. 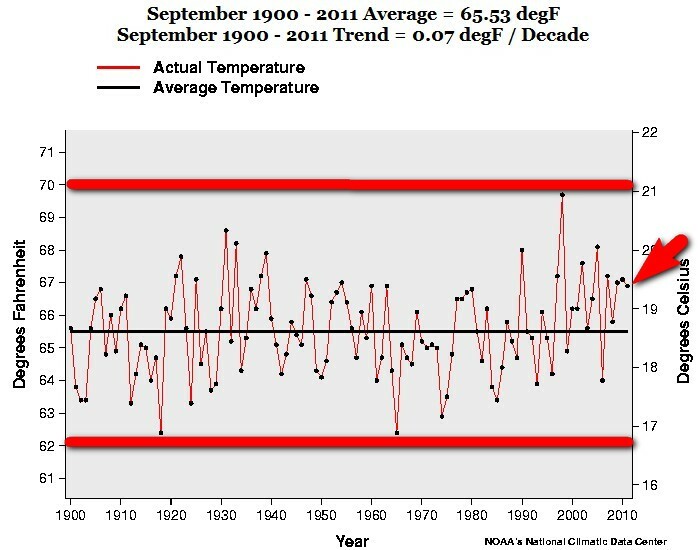 The September trend 1990-2011 is exactly 0.46 F degrees a decade. The September trend 2000-2011 is exactly 0.35 F degrees a decade. 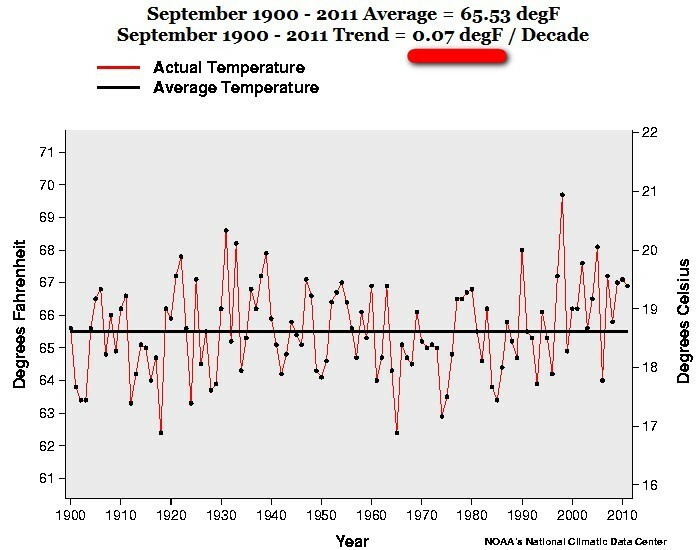 The official September temperature figures are out. 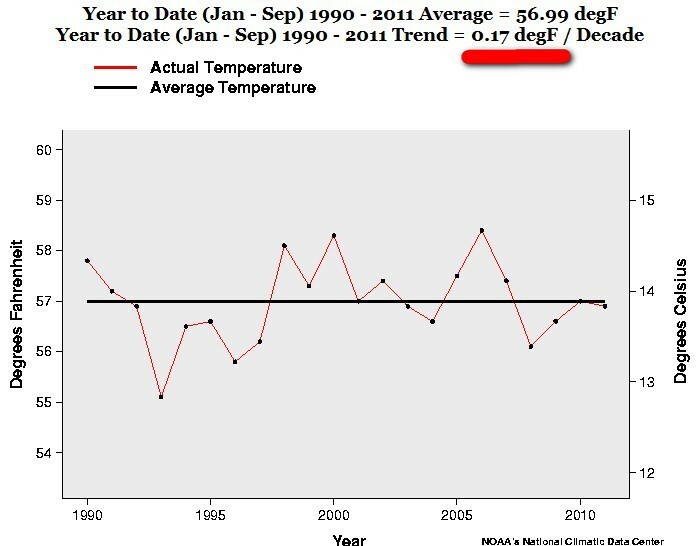 And it is down a little: – 0.16 deg F compared with September last year. 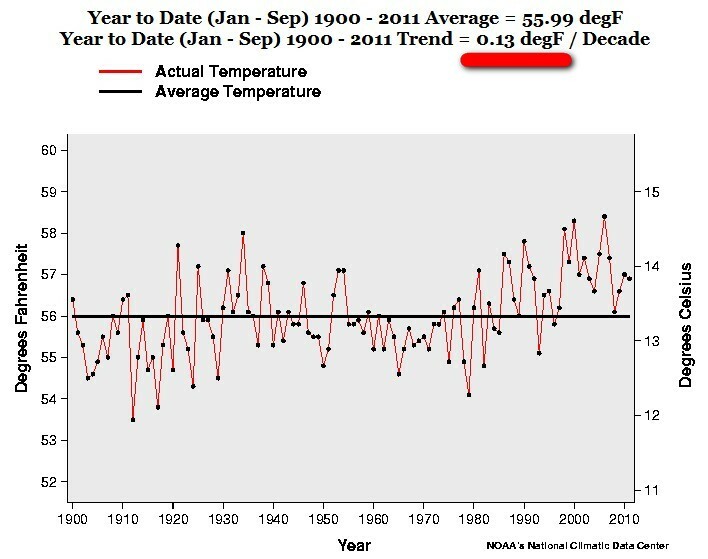 And the “warming trend” 1900-2011 is exactly 0.07 F degrees a decade. 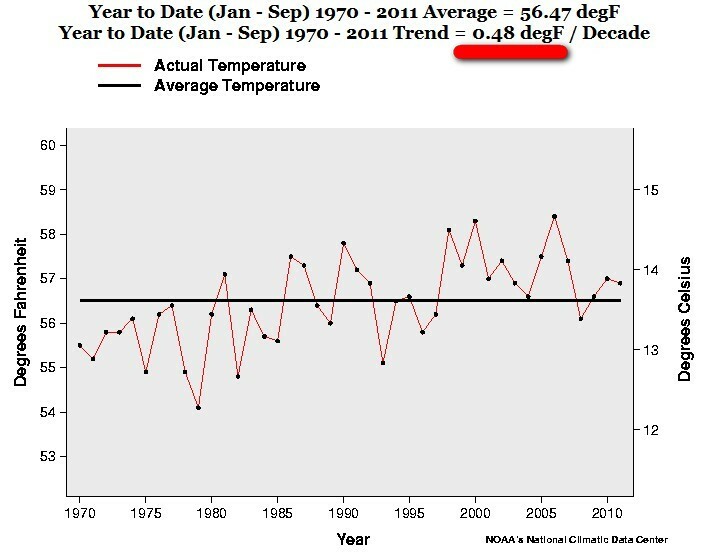 That is a whopping 0.7 F warmer in 100 years. The sweat is really breaking out! Notice the rise from 1918 to 1919. A rise of 7.93 F degrees. And the dramatic drop from 1917 to 1918. A drop of – 4.46 F degrees. A total change of a whopping 12.39 F degrees in two years. Talking about a temperature roller coaster. And notice the dramatic rise from 1985 to 1986. A rise of 8.36 F degrees. And the dramatic drop from 1911 to 1912. A drop of – 8.07 F degrees. 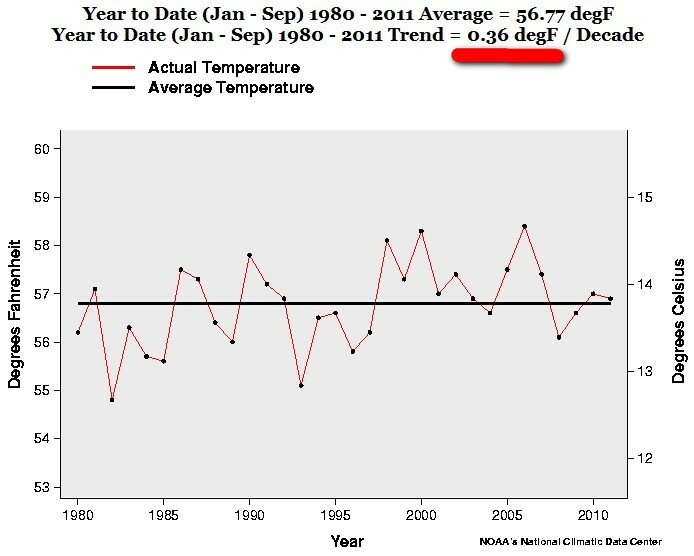 There are other years in the chart when the temperature increases 5 – 7 F in one year. And still, somehow mysteriously, USA went on as normal. But an ACTUAL RISE OF 8.36 F degrees IN ONE YEAR is nothing. And an ACTUAL CHANGE OF 12.39 F degrees in two years is also is nothing to bother about. So we can easily survive an actual change of temperature of 12.39 F degrees in two years. But a “predicted”, (by these “eminent” Global Warming Hysteric “scientists” and their models which cannot predict the weather one week from now), rise of 3- 4 F degrees in 100 years is a total catastrophe for humankind.